It’s easy to let bad habits creep up on you when you’re busy. For many of us, the working week means late nights, takeout coffees and TV dinners. By the time the weekend comes around, we’ve given up all hope of a healthy lifestyle, but perhaps this attitude is part of the problem. Rather than feeling defeated after a stressful week, try to see the weekend as the perfect opportunity to recharge your body and mind so that you’re more prepared when Monday rolls around. It’s never too late to up your health and fitness game, and even the smallest changes can make a big difference to your wellbeing. 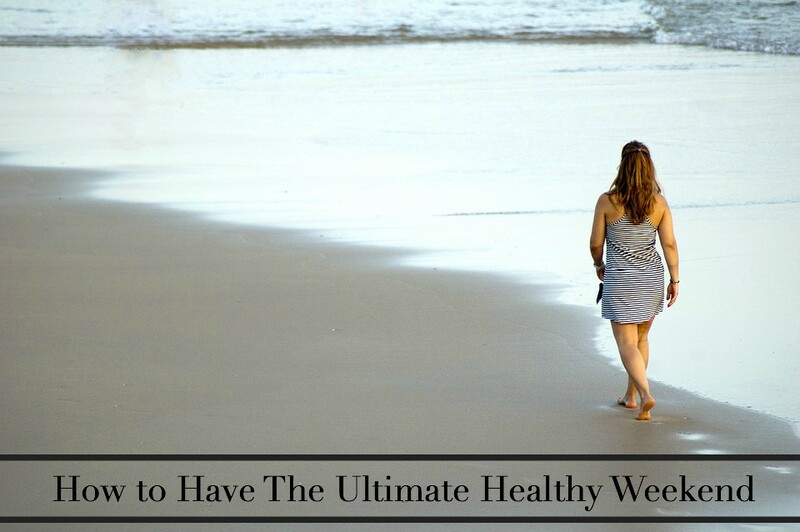 With that in mind, here are five steps to the ultimate healthy weekend. Start your weekend off with a healthy, protein-packed breakfast. A big bowl of porridge with banana, peanut butter, and some nuts sprinkled on top will do the trick, and don’t forget that glass of natural, homemade fruit smoothie on the side. Skip the caffeine if you can, as a morning coffee will dehydrate your body before it has had time to wake up. Drink a tall glass of water or a mug of herbal tea instead. Once you’ve refueled your body with food, it’s time to get moving. You don’t have to sweat it out at the gym or do hours of cardio, however. Take your dog for a brisk walk, drop into a yoga class, or take a jog around your local park. If you’re trying to maintain a healthy weight, but you don’t have much time, start small by exercising for just ten minutes a day. Research suggests that only a few minutes of High-Intensity Interval Training can be just as effective as an hour at the gym. The most important point to remember is that if a workout is fun, you’re more likely to keep doing it. Rather than sleeping in on the weekends, get up at the same time as you would on a weekday. Going to bed at roughly the same time each night and rising at the same time each morning helps your body to regulate its natural circadian rhythm. Try maintaining this habit, and after a few weeks you’ll find it easier to fall asleep at night, and you won’t wake up feeling tired and groggy. As well as looking after your body and recharging your mind, you want to have some fun during the weekend. If you hit the bars every Saturday night and spend your Sundays nursing a hangover, you’re going to start the week on the wrong foot. Ditch the alcohol this weekend and try something new. Why not head to Ticketsales.com and book to see a local show or sports event? You could invite your friends and make an evening of it. Before the week begins again, it’s important to unwind. Relaxation looks different to everyone, so you don’t have to be a meditation guru to reap the benefits of time out. You may find it relaxing to clean your kitchen, spend an afternoon reading or plant some bulbs in your garden. Whatever gives your mind a break from the stresses and strains of working life, make time for it in your weekend schedule, and you’ll thank yourself in the long-run. We LOVED this! While it's so tempting to let it all go on the weekends and binge out on bad-for-you foods and lay around, we feel the BEST when we stick to (mostly) clean eating and outside activities. Going on a hike and hitting yoga is such a great way to reset. And once we ditched going out and drinking on the weekends, we realized how much we'd been missing out on. It really does pay off to stay on track! Great tips Kim! With an online business, everyday is sort of the same for me so it is easy to stick to a routine. However when I was working the weekend used to throw me off! I definitely use the weekend to catch up on lost sleep and relaxation time. It is so important to live a balanced and stress free life. I always cheat so bad with food on the weekends. However most weekends I work out Saturday and Sunday. I try to get more sleep and relaxation too. My workouts are normally 10-15 minutes high intensity workouts. Oh i have to admit that I have been slacking off... too much lately so this was a necessary read for me.